When would you need meth cleanup? For many people, they don’t think that their homes are contaminated with meth, since there is no lingering odor or visible contamination. In fact, many unsuspecting homes in nice Utah neighborhoods have tested positive for meth. It’s a common misconception that you have to cook meth in homes in order to contaminate them; however, smoking meth can also cause homes to become contaminated. Moreover, contamination is typically found hiding in the walls and air ducts. If your home has recently been tested for meth with a positive result, all is not lost. We specialize in meth decontamination and home restoration, ensuring that your property is restored as well as safe. Why do you need to clean up meth contamination? If left untreated, meth contamination can remain on furniture and in your home. If can lead to a variety of health issues, including dizziness, nausea, breathing and respiratory problems, headaches, and irritation of the skin or eyes. Extended exposure can cause a burning of the lungs, and could lead to death. It’s crucial to rid it from your home. What does the meth cleanup process look like? If your home has been contaminated, the health department will require you to vacate the premises until the process has been completed. We will file for all permits and coordinate with the local health department overseeing the decontamination process. The first major step is shutting down HVAC systems, which could prevent recontamination through the process and ventilating the home. Our professionals will typically come up with a plan of action. In order to understand how extensive the damage and cleanup process is, we may need to do some pre-remediation sampling to test different areas of the home. This will help us come up with a cost analysis and see the scope of work that needs to be completed. The cleaning process follows, with removal of contaminated items and furniture. If the levels of contamination exceed the states standard, the carpet and pad will need to be cut out and removed from the property. Walls, cupboards, cabinets, fixtures, doors, windows and all other surfaces to remain in the home need to be washed down with a special solution. All of our chemical products are approved and certified Green and environmentally friendly, ensuring that they are safe for your home. The HVAC systems need to be shut down entirely during this process, as they could move the air and it may result in recontamination. Air ducts, trunk lines, and the furnace will need to be thoroughly decontaminated. This is done using a negative pressure cleaning process. Plumbing and septic systems may also need to be completely flushed out with water, probably multiple times. If there are sinks or bathtubs that have discoloring, they should be removed and properly disposed of. Once the area has been thoroughly decontaminated, additional testing will be performed in order to ensure that the home is safe and secure, and ready to be inhabited again.In countries with health department oversight, this testing will be coordinated with the assigned inspector for oversight. Having a specialist take care of removal and disposal of items is crucial. Meth contaminated items cannot go into the landfill. They need to be destroyed in a carefully controlled environment. There are licensed waste facilities where the materials are taken to and destroyed—one of the many reasons that a cleaning crew should do the decontamination. If your home is contaminated with meth, we can help. If your home has recently tested positive for meth contamination, or you’re looking to get it tested, contact us today. We specialize in identifying and eradicating signs of meth contamination, making your home a happy and safe one for years to come. 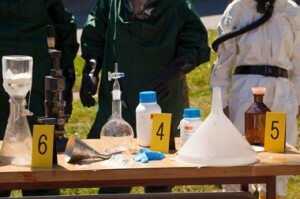 Contact Crime Scene Cleaners today for an estimate on meth cleanup at your contaminated property. With the proper cleaning and disposal, you property can become habitable once more.